Call your House Reps and ask them to support Net Neutrality before June 11, 2018, when the FCC can roll it back. 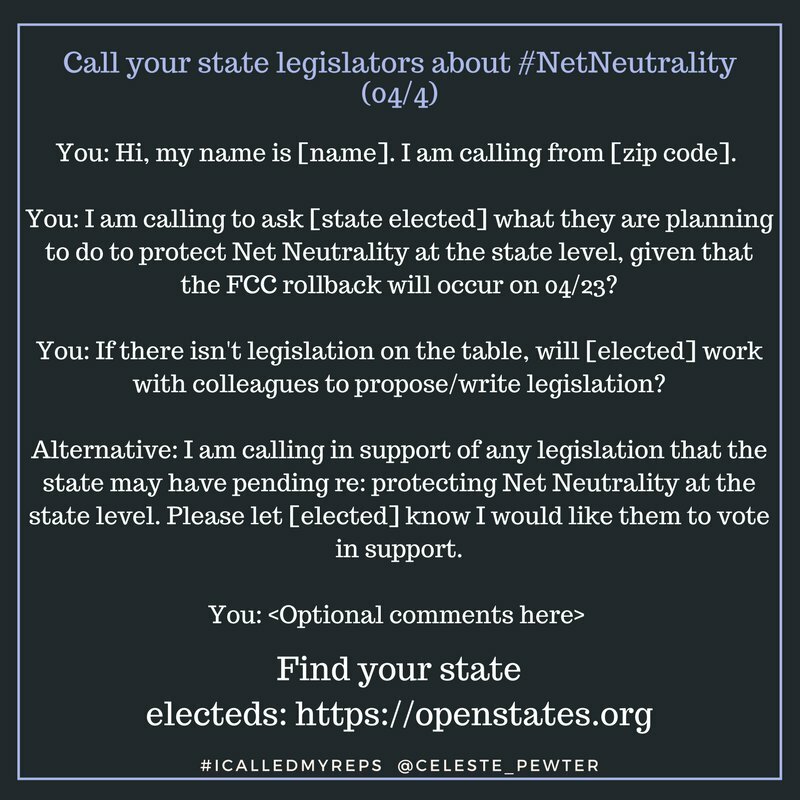 Also, call your state legislators and ask them to pass legislation protect net neutrality, too. After much struggle, the Senate voted 52-47 in May 2018 to overturn the Federal Communications Commission (FCC) and preserve rules upholding net neutrality, which prevent internet service providers from charging more for faster Internet speeds, and prevent them from blocking access to websites. Unfortunately, the fight isn’t over. The future of net neutrality now rests with the House of Representatives, where it has less support. That’s where you come in. 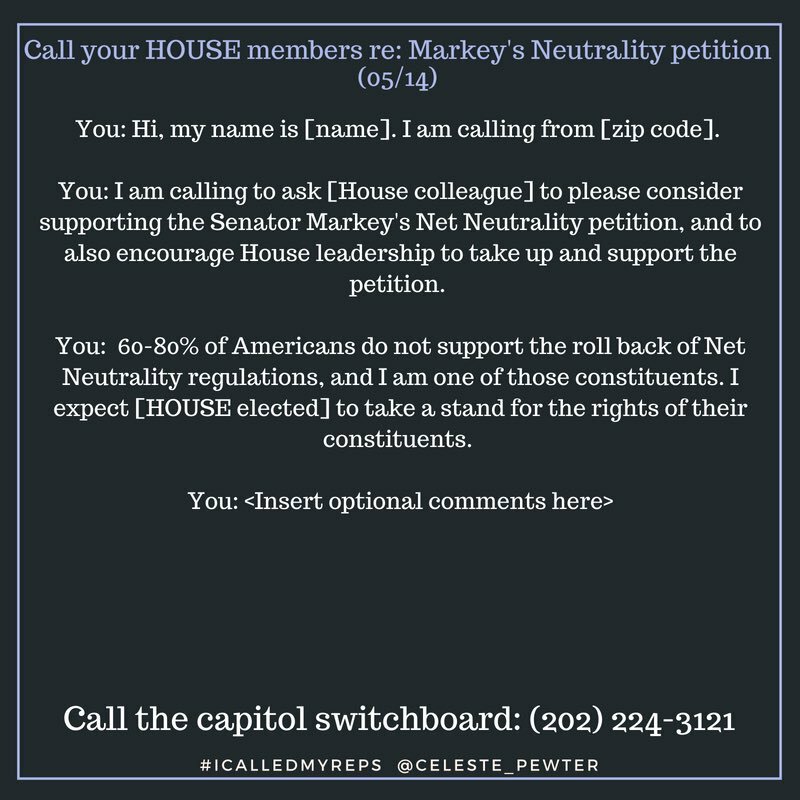 You need to call your House Rep and make it clear that you want him or her to uphold net neutrality. Celeste Pewter has been all over this for months now. Here’s her script on the topic. Remember: Congressfolk are back in their home districts until June 5, 2018. 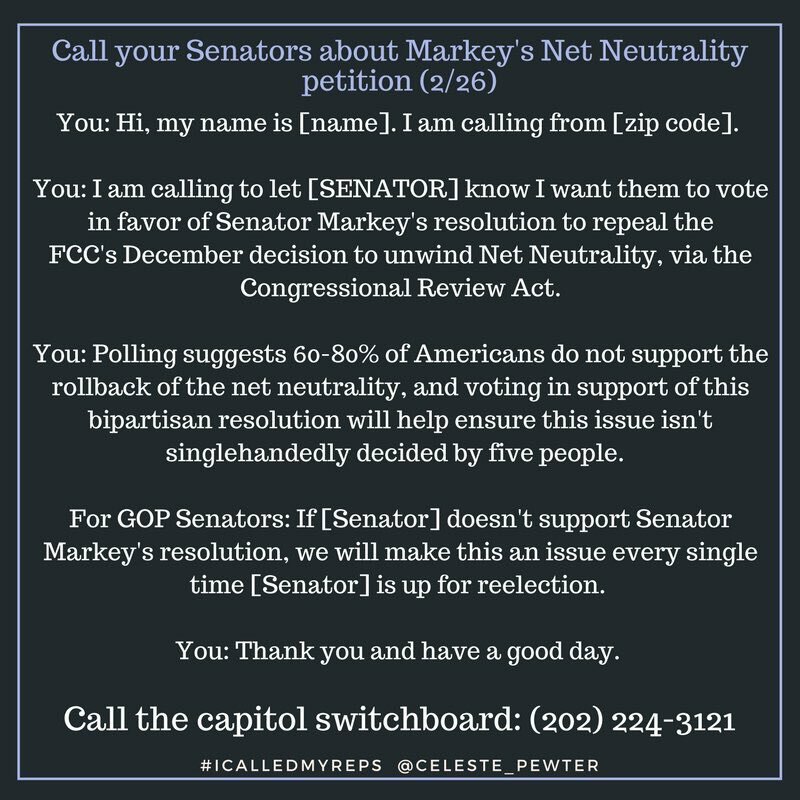 Call your MoCs and defend the principle of net neutrality, which ensures equal access to the Internet for all. The Federal Communications Commission could move to start repeal on April 23, 2018 (TODAY! So! 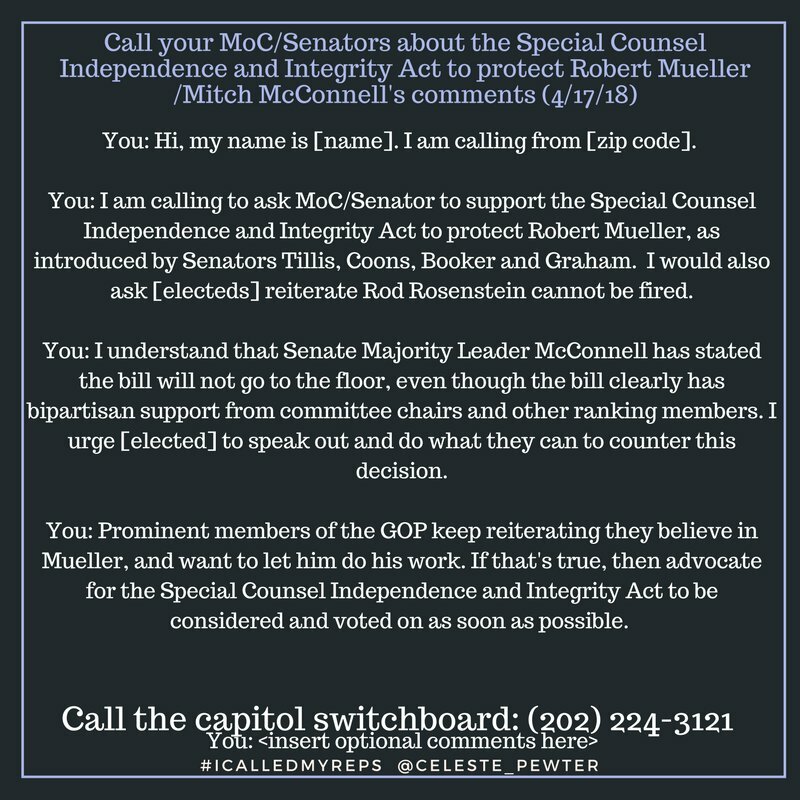 Call if you haven’t called yet, dammit!). We have 19 days before the FCC rolls back Net Neutrality. Mark your calendars for April 23rd. Spread the word. Act on both the state and federal level. Let’s make sure Chairman Pai doesn’t get the satisfaction of winning. 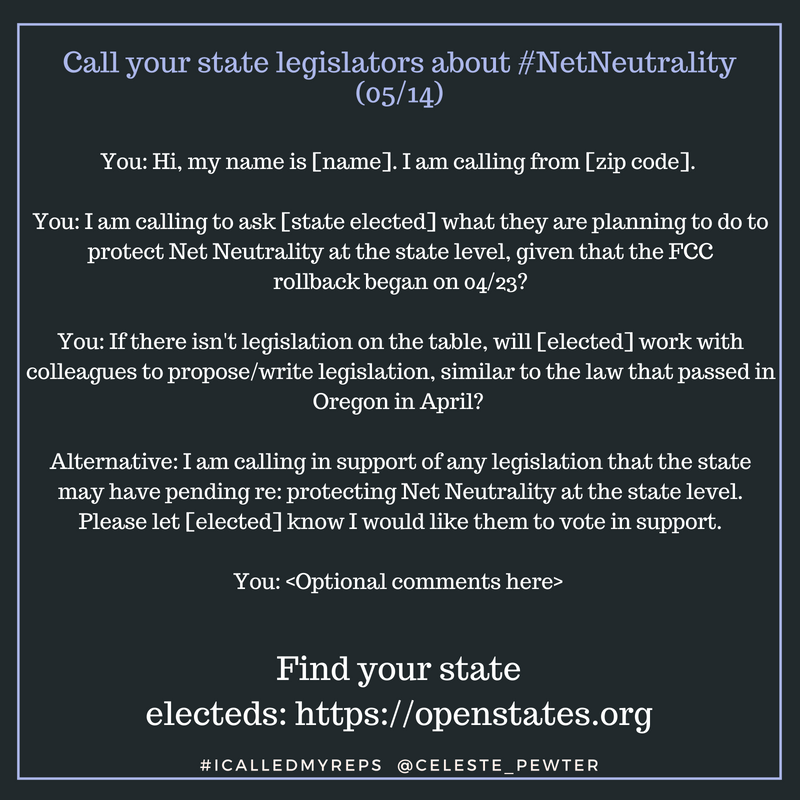 Call and email your state legislators and ask them to create laws that will protect your privacy on the Internet. Earlier, we urged you to call your house reps and ask them to vote against H.R. Res 86, which, if passed, would gut consumer privacy protections online. (We’re sure you won’t be surprised to know the bill was entirely sponsored by Republicans.) Well, it passed, and Trump signed it. Now we must turn to our state legislators to protect us from those who would harvest our data and sell it. Some state legislatures are already on the case. Illinois is working on a European-style “right to know” law that would tell customers what information search engines and social media platforms are gathering on them, and who they’re selling it to. Minnesota is mulling a law that would stop Internet Service Providers (ISPs) from selling consumer information without written permission. Massachusetts state senators just introduced a bill similar to Minnesota’s. The first step in asking your state legislators to pass laws protecting your online privacy is knowing who they are. Then call or email them and ask them to pass laws that protect consumer privacy online, assuming they aren’t already doing that. If they are, tell them that you support their efforts, and ask what you can do to help make them law. Call your MoCs and defend the principle of net neutrality, which ensures equal access to the Internet for all. The Federal Communications Commission could move to start repeal on April 23, 2018.